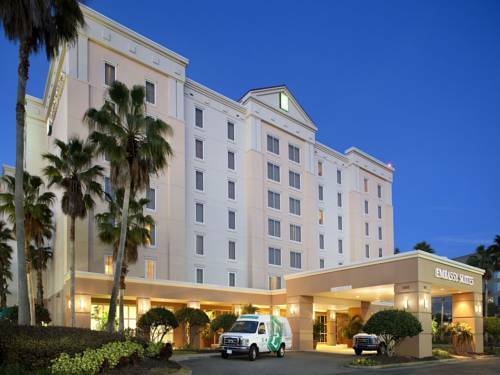 Welcome to Embassy Suites Orlando Airport hotel located less than one mile from Orlando International Airport /MCO/. Our all-suite hotel features two room suites free made-to-order breakfast a complimentary nightly evening reception and a complimentary 24-hour airport shuttle to and from Orlando International Airport. Other amenities include an outdoor heated pool whirlpool spa fitness center and business center. In addition guests are sure to love our exceptional location just a short drive from Universal Orlando Resort SeaWorld Orlando and Walt Disney World Resort. Plus enjoy our close proximity to International Drive shopping dining and entertainment. Dine at Kitty Hawk Cafe featuring traditional favorites including soups salads hamburgers and entrees or if you*re looking to dine in the privacy of your own suite just order in-suite dining direct to your room. For those searching for a hotel near Orlando International Airport for your next business meeting social event or wedding you*ve found the right place. Our professional and friendly Sales and Catering team is here to ensure your event is a success in every way. All reservations must be guaranteed with a major credit card or adv cash deposit to hotel regardless of time of arrival. All reservations must be cancelled 24 hours prior arrival host time unless deposit required. Policy subject to change. All reservations must be cancelled 24 hrs prior arrival host time unless deposit req. If this reservation has been made electronically please cancel it electronically to avoid confusion and a no-show bill. Policy subject to change. Located in our beautiful Atrium the Kitty Hawk Cafe features a varied menu of traditional favorites. Enjoy a relaxing cocktail or one of our Chef*s delectable creations. Enjoy the tasty delights of the Kitty Hawk Cafe in the comfort of your suite. Our full menu of in-suite dining options is available from 1100 AM - 1100 PM daily.